Every release from Spaceman Effects is highly anticipated. I am often approached by delaers and Spaceman fans asking if I know what the next release will be. Even when I tell them that I find out when they find out they like to put their guesses in anyway. Delay? Mercury III version 2? Re-release of the Sputnik Fuzz? I can honestly say no one has ever guessed Spaceman would do a phaser but they have now! And it is amazing! 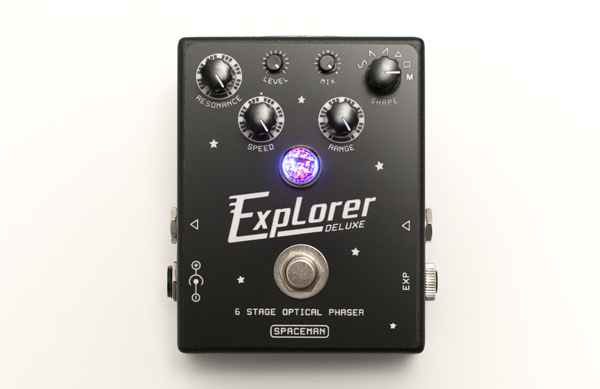 The Explorer Deluxe is completely hand-soldered and handmade in Portland Oregon to the highest degree of quality possible. These are truly artisan-crafted tone devices, sparing no detail within or without. The Explorer Deluxe utilizes true-bypass switching via the heaviest duty mechanical footswitch available, while your tone is transferred via quality open-frame Switchcraft jacks. Open one up and you’ll see an unparalleled display of craftsmanship; with immaculate hand-soldered PCB's, and detailed military-spec wiring. On top of its cast aluminum enclosure sits a durable, engraved vinyl faceplate and indicator jewel. This pedal is truly built to last a lifetime.